The internet has made keeping secrets a bit more tricky, so if we’re going to get tourists coming to surf, we figured we may as well give them some local competition. As we said, the locals here love surfing. The reef doesn’t scare them, size doesn’t scare them and sharks don’t scare them. The only thing that really gets them out of the water is their mamma screaming at them from the beach or water temperatures below 20°C. Given this enthusiasm we figured they deserved some assistance. VSA believes significant social good can be realized through surfing. We support community aims through our programs and relationships in the communities of Pango, Eratap, Pele and Tanna. To get this far the VSA has been running domestic competitions every year. You can get all the latest news on domestic comps and events by keeping an eye on our Facebook page. The Village of Origin competition series allows our domestic Boardrider clubs of Pele, Eratap and Pango to host comps at their local break and in addition to these regular club events the VSA holds the premier events, the Easter Classic, and the Independence Cup most often at the left hand point break known locally as Emis, near the village of Pango. The opportunity to compete at an international level adds legitimacy to the hours spent training and improves self-­‐esteem. 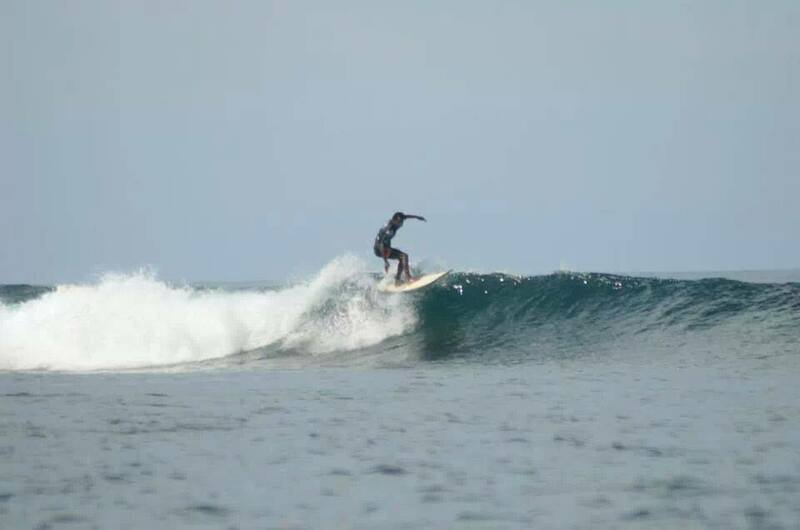 VSA supports local Ni-Vanuatu surfers to travel to competitions as an essential component of reward for effort. 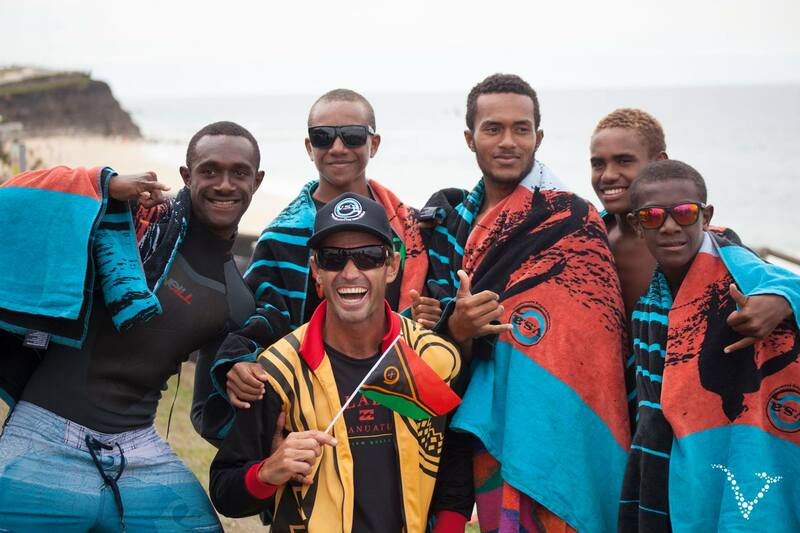 2012 was the year that Vanuatu surfing as a whole realised they could really shake things up regionally when they again won the Melanesian Cup, this time on home soil. In 2013, the event was held for the first time in Fiji at the world famous Cloudbreak. With a strong, yet still mostly inexperienced team, Vanuatu went to Fiji and with a dominant display within the junior ranks pipped out New Caledonia to again win the Melanesian Cup. VSA won the Melanesian cup again in 2014 in Samoa, but was beaten by a strong performance by New Caledonia, and both the introduction of our friends from New Zealand to the event, and the introduction of Stand-Up Paddleboarding to the Melanesian Cup format. Vanuatu Captain John Stephens and Vanuatu women’s competitor, Reshma Kalotiti, high five between heats at Cloud Break. John Stephens flies down the line at small Cloud Break during his Longboard Heat. 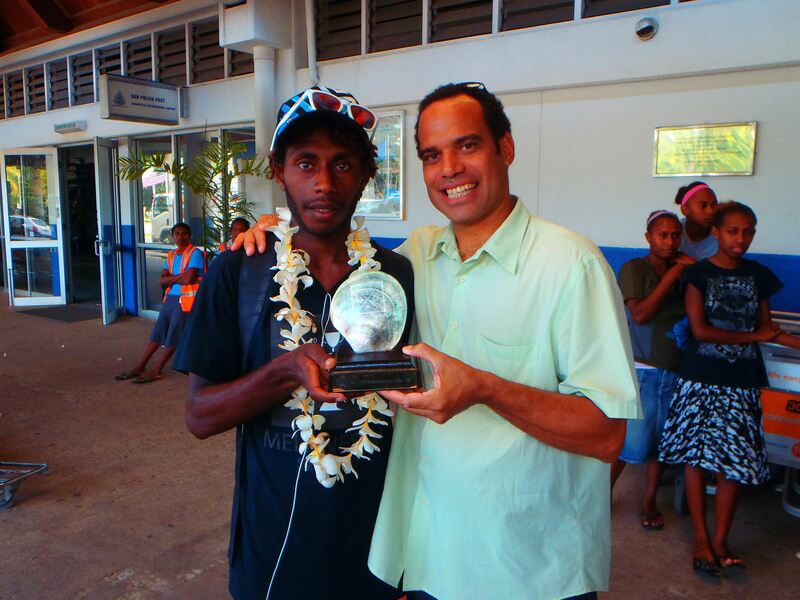 MP Ralph Regenvanu (VSA Patron) congratulates John Stephens on the teams win in Fiji. In 2013 & 2014 VSA sent a High Schools team to compete in the prestigious Newcastle High Schools Challenge at Surfest. In 2015, VSA was stoked to send a squad selected from surfers from our Outreach communities, including Tamata Satungialin from Pele, and Jason Aissack and Samson Meltek from the community of Eratap. Together with the Pango Squad these surfers excelled, finishing 7th out of 64 teams from throughout New South Wales & Australia! The team also got to meet Joel Parkinson, Occy, Steph Gilmore and a host of other surf stars and to top if off, 3P surfboards gave each team member a brand new board each ….something they could have only ever dreamed of! In 2016, on the back of a big year for womens surfing development in Vanuatu, we were stoked to send a squad of Vanuatu’s best female surfers to compete at Surfest. Marine Cugola, Charly Donchos and Serah John from Pango Boardriders were again joined by surfers from our Outreach communities. Tarisu Seth (Pele) and Alex Tain (Eratap) as well as Roger Taleo (Pango) all put in strong performances in the teams event, showing just how far surfing in Vanuatu has come. In a first for Vanuatu surfing 16 yr old Roger Taleo was invited to compete as the Wildcard in the main event – the Maitland and Port Stephens Pro Junior! Paul Parkes from 3P Surf Boards kindly donated boards to the stoked grommets from the VSA High Schools team competing at the Newcastle Now High Schools challenge – Onya Paul! VSA High Schools Team; Camillo, Albert, Jeremy, Roger and Jun Jun, with VSA coach Ben Johnson stoked at their final result! In 2015 & 2016 VSA sent mens and women competitors to compete at the annual Noosa Festival of Surfing. VSA surfers have been welcomed into the fold of one of the world’s biggest and best surfing festivals, and our surfers always come back from this event full of the stoke of surfing. Hopefully these efforts will pay off and in the years to come and we will see some Melanesian representation at WSL/CT events. VSA encourages young people to document their perspectives about surfing in a community context. We assist in finding ways to access media making tools as well as showcasing the products on our social media. VSA pursues opportunities for the accreditation of our surfers, if you are an accredited trainer wanting to donate your time or skills to helping out please get in touch!